Cathy Sousa - Benedict Associates Ltd.Benedict Associates Ltd.
Cathy is a compassionate and engaging counselor who brings a deep interest in the well-being of people to her work. With a practical and down-to-earth style, she easily forms therapeutic relationships with clients from a variety of ages, backgrounds, and experiences. Cathy has a Master of Science (M.S.) 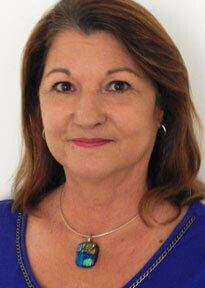 in Counseling from Indiana University and has been counseling in Bermuda since 1998. She has been involved in counseling both adults and young people in a range of areas. Specific experience includes Employee Assistance Programs (personal and work related issues), Sexual Abuse/Assault, Domestic Violence, School, Career, Parenting, and Couples Counseling. Cathy has also worked for the Bermuda Government Department of Child and Family Services providing service to foster children and their families, as well as working with the Family Court. Cathy has an extensive knowledge of Learning Disabilities and their impact on families, school and the workplace. In addition to counseling, Cathy enjoys providing trainings, workshops and group sessions on topics related to Grief & Loss, Parenting, Self Esteem & Social Skills, ADHD, and Personal Development. She has a special interest in assisting young people and their parents and is currently completing a Post Master’s Certificate in Child and Adolescent Therapy. I have the opportunity to work alongside a group of outstanding professionals assisting companies and individuals in meeting their personal and professional objectives. My joy of learning, and my ongoing dedication to my own personal and professional growth and development. Counseling is a unique relationship within which people feel safe and secure enough to share both their hopes and dreams, and their concerns and challenges. The counseling relationship facilitates and supports the development of effective strategies for dealing with the inevitable problems that arise in life, while at the same time assisting with the proactive process of identifying personal goals and aspirations and establishing a path for their fulfillment. I believe that every individual has the capacity for love and joy, and that we all have the potential to live rewarding and inspired lives. To this end, I am a passionate advocate for human rights, promoting equality and freedom so that each and every person has the opportunity to pursue their dreams.